My sincerest apologies to all of the baby sweaters that may be reading this post. Because what I am about to show you may incite feelings of insecurity, jealousy, perhaps even self-loathing. It's to be expected. 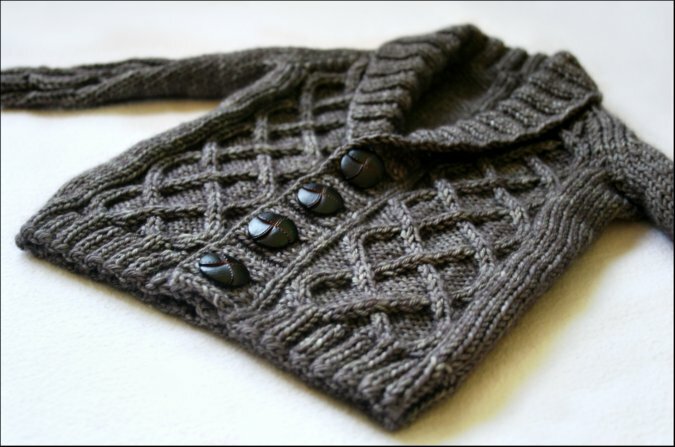 Those feelings are normal when you are dealing with a handknit this perfect. It's my finished Gramps Cardigan by Kate Oates, knit from Madelinetosh Tosh dk in Vintage Frame. This is my favorite baby knit to date, and maybe my favorite knit EVER. Because I am all about dressing our new little one like a preppy Grandpa. I imagine our baby wearing this sweater and studiously reading a baby book by the fire... because that's what a baby would do if he owned a sweater like this... and he would have very smart looking baby glasses and perhaps even carry something... like a baby handkerchief.. or something.. as well. Yes. Definitely. I don't know what I like more..
Is it the cables.. the shawl collar.. the color?? Frankly, the entire combination is just crazy adorable. Who said it wasn't fun dressing a boy?! I want to knit one in every size the pattern comes in, so he will always have one to wear. I'm a bit obsessed.. can you tell? I'm having a baby in 3 days. Emotions and hormones and irrational thoughts are running high. 3 days? How exciting! Knit and Tonic just mentionned that it was soon, but I wasn't aware it was that soon! 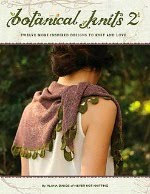 Beautiful knit indeed! Love the buttons, they are so perfect! Wow! Congratulations on the arrival of new baby! Aw, precious sweater! Your baby is going to be known as the best dressed baby in the neighborhood. Can't wait to see him sporting his sweet outfits! Three days! You are definitely feathering your nest with all of those little knits. All the best for the upcoming birth! It's exquisite made only more beautiful by your photos. Put your feet up. He will be the best dressed little man in the neighborhood. So very nice can't to make it myself. 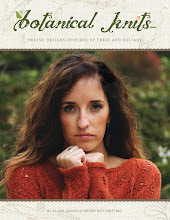 I need a Granny Cardigan pattern! I love this. I have had my eye on this pattern for quite some time . . . I do have a new nephew I could knit this for . . . But first, I MUST get my little girl set for her arrival into the world! Good luck this weekend-- I hope a new family member joins you! What a sharp little man he's going to be! All the best to you with your birth. Absolutely adorable sweater....all it needs is some suede patches at the elbows! Wishing you well at the birth....I know all will go well. Good luck to you!!!!!! Hope you are taking some time off after you have the baby to enjoy him!!!! I agree, best baby sweater ever! 3 days? All the best! What a gorgeous yet manly sweater for your little boy! I am so excited for you! 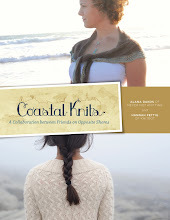 May all go smoothly and please share photos as soon as you are ready showing your wonderful knitwear being worn! That is just beautiful! And is in my que for my grandson and son... Too precious! Ha ha, studiously reading a baby book by the fire. I love it! That IS perfection! The buttons totally set it off. great looking sweater!! best wishes on the new baby's birth!! Alana this is absolutely gorgeous! He will definitely be the best dressed baby around! As Beautiful as this sweater is it will be even more beautiful and special when your little one is in it!! I hope you will post some pictures when that happens. Congratulations and Best wishes! From a Mom of 3 Boys who wishes she had been knitting when they were little. Alana, I have to agree. The cutest boy thing I've seen! Best wishes! Alana, I LOVE this sweater! You did such a beautiful job -- and those buttons are to die for! So, now, 2 days - I am catching up on my blog reading after being out of town on business. An absolutely lovely (& oh so cute) baby sweater. You new small one will love it - well all of us do, so that is just reasonable, right?. omgosh squee. this is sooo cute! i love love LOVE those buttons; they are too perfect. can't wait to see your little one! It is absolutely gorgeous. Your beautiful hand-knits for the baby are very inspiring. Good luck in three days or when the baby choose to arrive. Love, love, love. I'm a mom of three boys so we find "cute" clothes when we can. Unfortunately at ages 10, 8 and 5 they won't wear handknits anymore (other than hats and fingerless gloves) because "none of their friends wear these types of clothes". Make them while you can. Counting, counting...Good luck to you! adorable knitting, thank you for sharing! What an adorable sweater :) I love when baby boys are dressed like little old men, especially with a cute pair of cords and a cute sweater. and maybe a baby golfer hat. Beautiful sweater. Best wishes for your delivery. A November 7 baby--how fantastic. My daughter was born November 7, and it's a perfect time of year to hole up with a new baby! Enjoy every minute of your beautiful, sweet family. And the sweater is totally divine!! Good luck with the delivery--you all are in my prayers! I love the set, I think that is the cutest baby boy sweater I have ever seen! He is going to be so adorable. I am not even near enough to kiss those precious baby toes, but seeing all things make me feel like a proud "Auntea". Thats fantastic. I look forward to a pile of beautiful pics. 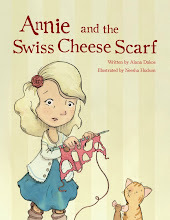 i am officially inspired to knit this for my DAUGHTER! I love the buttons too. What a lucky little boy. Best wishes on his upcoming birth! I LOVE it! I keep checking your post to see how you are doing and it seems like you are doing just fine! 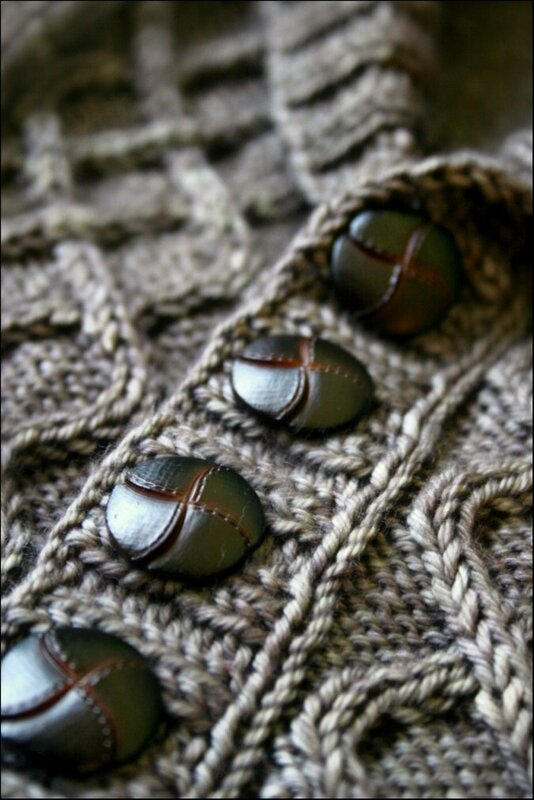 Beautiful and I love the buttons. From an old mom of boys, I think it is so cool that there are better boy clothes out there now. 27 years ago when I couldn't find anything cool for them, I whined all the time and what I should have been doing is designing something boyish. Sons are the greatest! Best wishes. This is AMAZING!!!! I absolutely adore it. You've designed such cute girl clothes - I can't wait to see what you design for boys! This is such a beautiful knit for a baby boy! Congratulations! I LOVE it. The pattern is great, and your version is just stunning. I have a little boy due in February, and will definitely have to make one of these for him, as well. Beautiful little sweater, Alana! Best wishes to you at this wonderful time in your life! We all look forward to the terrific boy patterns you'll be designing in the coming months! Soo amazing! I can't wait to see that outfit, modeled! Please make sure he wears a bowtie with that like my Grandpa did! Too funny! But it is so adorable! and he is almost here!!! Super gorgeous cardi! I love cables. 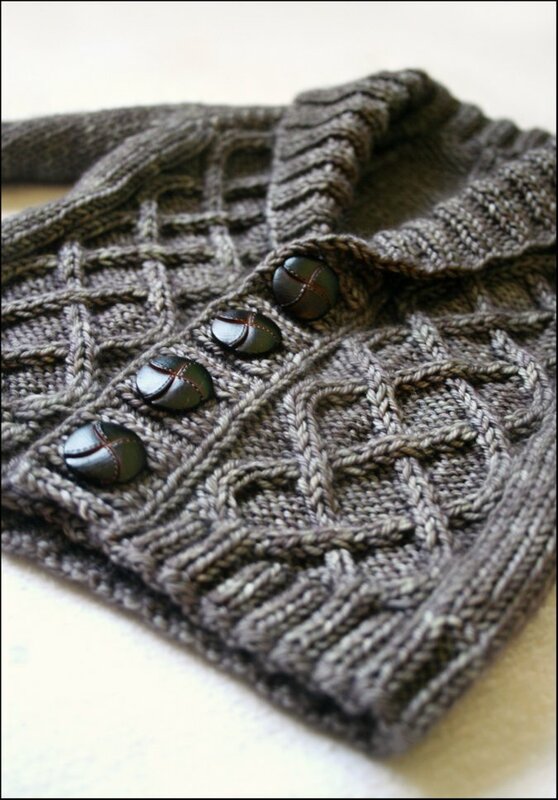 This cardigan features perfect combination of cables, yarn, color and buttons. This is GORGEOUS!!! Wow, I don't even have, or am expecting a little one and you've made me want to knit one in every size and color I can too! I'm officially inspired, thanks! Oh! Congratulations and good luck to you! The baby sweater is gorgeous! The yan is as well. Wow! The buttons are the perfect finish! I'm old enough to remember an actual grandpa wearing a sweater with those buttons - flashback! adorable! Baby Boy must be here now! Hope all went smoothly and you and your family are enjoying the new arrival! This is a super cute baby costume. Beautiful sweater! You must have had your baby by now so a big congratulations!! Hope we'll see pictures of him modeling some of the gorgeous knits you made! Alana this is so cute! I just bought some Mad Tosh to make this for a friend. I had heard the pattern was a little tough, though. Any thoughts? Can't wait to see the baby pics!!! It's stunning! I might just have to cast on myself! I love it, I always got a little frenzied right before my babies were born, he's going to look adorable(and smart) wearing this sweater!